In order to provide a network of people to take care of the Bridport river system, a team of "River Guardians" has been set up. These people take an interest in a particular stretch of river, usually near their home, so that they visit it frequently and are able to monitor its condition. 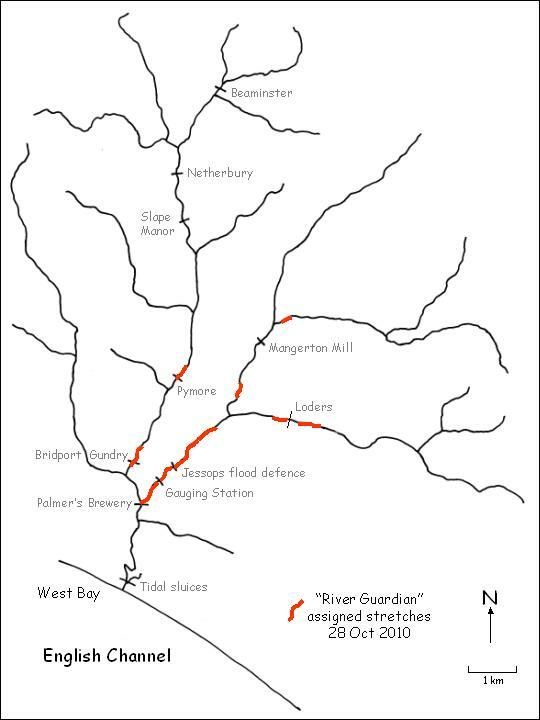 The following map shows regions of the rivers already allocated to a "Guardian". If you would like to participate in protecting a stretch of the river, no matter how short, please get in touch (see Contacts). 1. The River Guardians each form part of an informal network of people who live near or regularly walk by stretches of river that they are able to monitor. 2. Each Guardian need only have an active interest in the river, and need not be a fisherman or otherwise qualified. 3. The purpose of the network will be to allow easy communication with like-minded people in case of problems arising with the river, that might require moral support to deal with, or wider community action. 4. 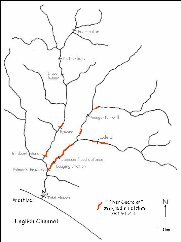 The sections of river covered by a Guardian will be summarised by a map on the web. No personal details of any Guardians will be published on the web. 5. The intent is that there will be occasional emails to all Guardians, perhaps with updates on progress of the Friends of Rivers. 6. Individual Guardians will be able to report problems using that email distribution list, or directly to another Guardian, as they so wish. 8. Becoming a Guardian represents no more commitment than endeavouring to keep a fairly regular watch on a stretch of river, say every 2-4 weeks, at least, but, in the case of dog walkers, preferably daily.